As a result, many airlines are wondering why they need to install seat-back screens in the first place. 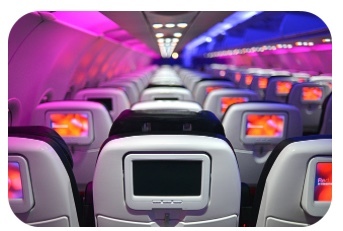 Besides being increasingly obsolete, in-flight entertainment systems can account for as much as 10 percent of an aircraft’s total construction budget. They also add weight which leads to increased fuel costs. So rather than set up expensive screens that no one will use, airlines are switching to streaming platforms that provide passengers with on-demand video content through their devices. Do airlines risk upsetting their customers by phasing out seat-back screens? Why must airlines ensure that amenities like power outlets are functioning properly? Source: Christopher Mele, “Airlines Phasing Out Screens Because You Are All on Your Devices,” The New York Times, February 16, 2017. Photo by Ronald Sarayudej.